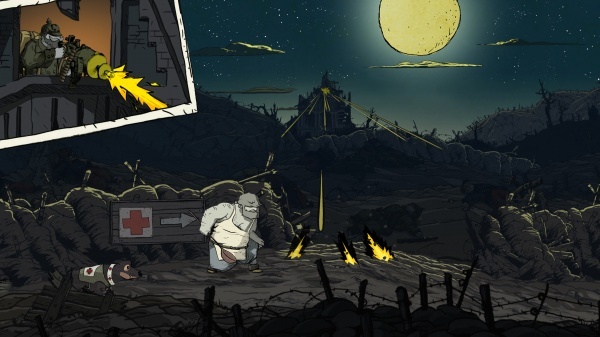 Valiant Hearts: The Great War has an unusual setting for a game, World War I, and an unusual format for a game set during a war, classic adventure game. Add to that a unique comic-inspired art style and emotional storyline, and you have an atypical game that at the very least is certainly a curiosity. But are its style and atmosphere enough to make it a good game? Let's start at the beginning, because that's where the game starts, at the open of the Great War, the War to End all Wars, dubya dubya one. A German farmer, Karl, living with his French wife in a part of Europe that happens to be in France in 1914 is forced to return to his country of origin at the outbreak of hostilities where he is promptly conscripted into the army. His father-in-law Emile comes to the farm to help his daughter with the work, but he too soon finds himself in the army, but on the side of the French. Soon his path crosses that of an American volunteer in the French army, Freddie, and Anna, a Belgian student trapped in Paris by the frontlines who quickly puts her education to work in helping to care for the war's countless injured, both civilian and military. You'll take control of each of these characters, sometimes in tandem, as their stories intersect and diverge across the backdrop of the major events and battles of World War I. The game takes a very low-key approach to its storytelling, which works well with its theme of the small personal struggles faced by individuals swept up by overwhelming tragic events of epic scale. Each level is introduced by a narrator who explains how the events of the war and the actions of the protagonists have led to the level which you're about to play. Further historical context is conveyed through short text snippets available from the pause menu, which give both a short history lesson and serve to show how events from the war shaped the design of the current level. Within a level characters only communicate through grunts or short pictograms in comic book style speech balloons, leaving the events in the level and the actions that you take to speak for themselves. It all works well to add a level of reverence and gravitas to the game appropriate for an event as deeply tragic as World War I - an especially impressive accomplishment given the game's comic style art work. The game makes some forays into the comical and the absurd, and since it treats everything else with such reverence these deviations seem strangely out of place. A level replaying the mobilization of Paris' fleet of taxis to rush soldiers to the front to save the city is played while the Can-can blares in the background and the main antagonist, Baron Von Dorf, is a screaming caricature of a German officer who could easily have come straight from a propaganda poster of the time and is prone to flying around in fanciful zeppelins or driving steam work tanks. Moments and characters like these feel out of place in the game, especially when at other times it has you doing things like saving a young mother from poison gas or amputating an injured soldier's leg. As for the gameplay itself, it's primarily cut from the traditional adventure game cloth. You'll spend time searching for items needed by characters or to interact with other objects. There's no inventory to manage as you can only carry one item at a time, and the item interaction is all pretty straightforward and never deliberately obtuse. 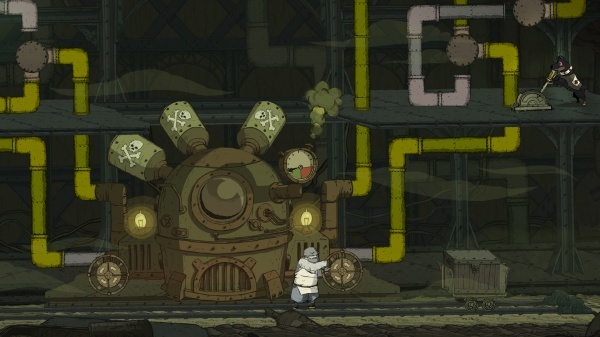 You'll also encounter some puzzles that require you to figure out the correct sequence of levers to pull and wheels to turn, or that involve tossing dynamite or grenades into just the right spot. There are also a few arcade-like sequences that have you doing things like dodging dropping artillery shells, driving a car while under attack, or driving a tank across trench works. None of these gameplay elements are particularly difficult or challenging (and even if you do find yourself stuck at some point an in-game hint system will point you in the right direction), and I found that I could steadily make my way through each new level without too much difficulty. Finding all of the hidden artifacts in each of the levels sometimes proved to be more challenging than solving the puzzles themselves. I point out all of this to let you know that if you're looking for challenging gameplay you won't find it here. To appreciate Valiant Hearts you need to appreciate a good story and have a desire to learn more about a world-changing war that occurred a century ago. I would have enjoyed it if there was more challenge to the game's puzzles, and if there were a greater variety of puzzle types, but the story and atmosphere alone were enough to drive me to keep going and see where it would all go. It's easy to recommend the game to anyone who appreciates a well-crafted and touching story or to those who enjoy a game that's decidedly different than most other games. Final Rating: 84%. A story-driven journey through a war that's been overlooked by video games.